This soup is so rich and creamy and highlights the diversity of the simple avocado! Published and taste tested on KYB Connected, first. You can serve this hot or cold. Enjoy! Add your favorite grated vegan cheese on top, or dairy cheese if vegetarian. Garnish with roasted and salted pepitas seeds on top or tortilla chips. *I like to use coconut oil with avocado; the taste is amazing. But, you can use butter, vegan butter, or any oil of your choosing. Set a medium skillet over medium-low heat and add the oil once the pan is warm. To test the pan, I rest my hand a few inches above the cooking service. If your hand feels warm, you are ready to add oil! Once the oil dissolves, stir in the onion and optional jalapeno. Let them cook, stirring occasionally, until the onion has started to caramelize. The color will become translucent and the edges will begin to turn light brown, about 12 to 15 minutes. 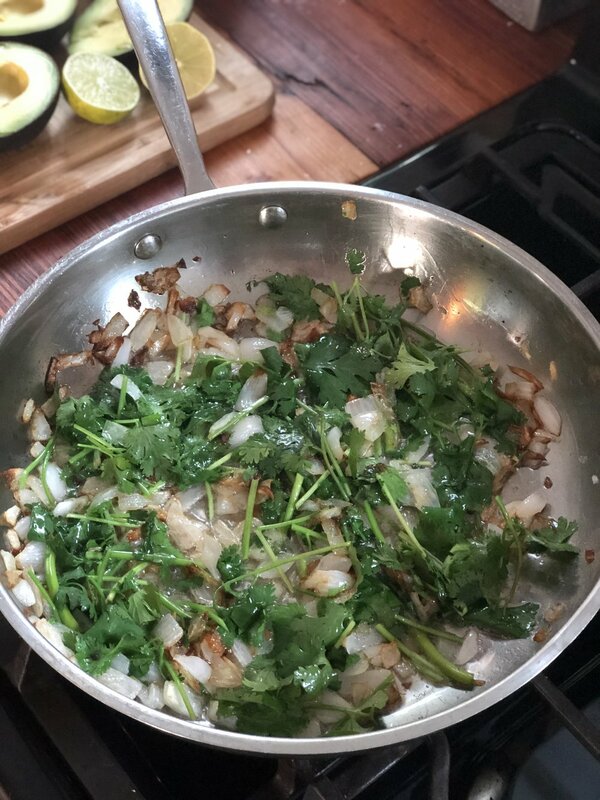 Incorporate the cilantro leaves and mix them in with the onions and jalapeno. Once the cilantro has wilted, 30 seconds to a minute later, turn off the heat. 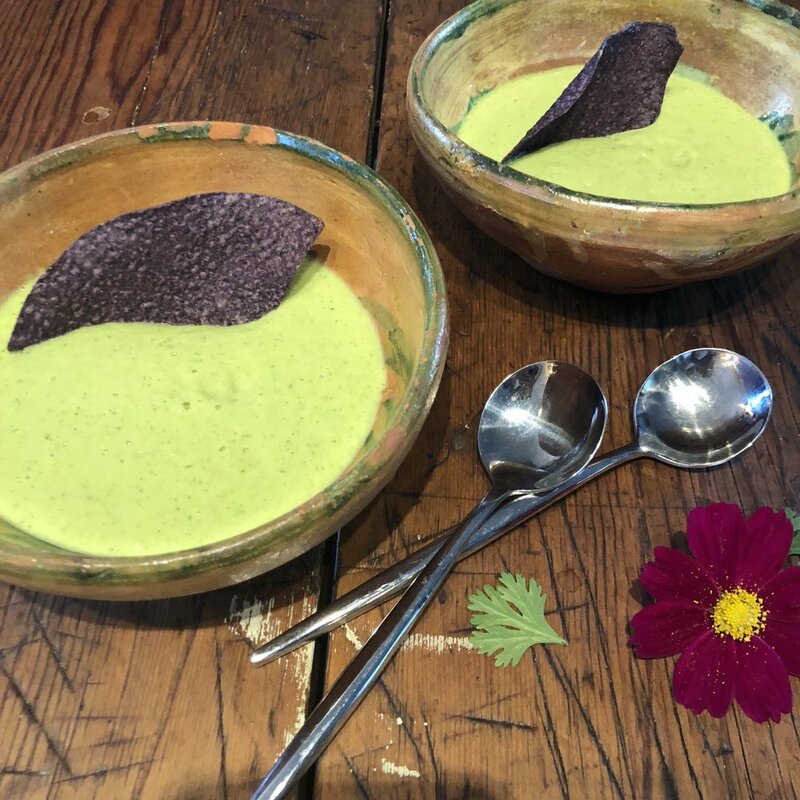 Place the peeled avocados in the blender or food processor along with the cooked onion, jalapeno, cilantro, broth, lime, and salt. Puree until smooth, taste for salt and add more if need be. You may serve bowls and add your choice of garnish, or put garnish choices on the side. I like to add them on the side as my guests usually all have different food preferences. A little more about AVOCADO: Avocados contain the plant chemical beta-sitosterol which helps maintain healthy cholesterol levels. They are packed with monounsaturated fat and according to the American Heart Association, when monounsaturated fats are eaten in moderation in place of saturated and trans fat, this can help reduce the bad (LDL) cholesterol. A little more about CILANTRO: Cilantro and coriander are powerful aids to digestion. According to Ayurveda, allergen reactions result from improper digestion and an accumulation of ama (toxins) in the physiology, which weakens the immune system and distorts the body's response mechanisms. Cilantro and coriander, by enhancing digestion, work to alleviate the root cause of allergen reactions.